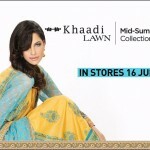 Khaadi’s Mid-Summer Lawn Collection is coming to stores on 16th June! Get inspired this summer with Khaadi’s chic and startling prints! Feel the freshness of summer season with latest Summer Lawn Collection 2012 by Khaadi that revives the dying art and colorful patterns. 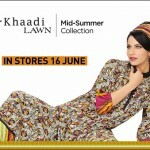 Khaadi brings sensational lawn prints and designs with its latest Khaadi’s Mid-Summer Lawn Collection. Khaadi Mid-Summer Lawn Collection 2012 bestows a dynamic array of textures and saturated hues like green, black, blue, and red. The color amalgamation is quite perky making one feel the pleasure of summer. 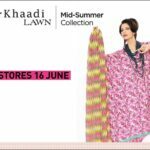 Lets have a look at Khaadi’s Mid-Summer Lawn Collection ….